Developer Nicalis has decided to follow in Capcom’s footsteps with the release of Blade Strangers, a fast-paced, combo-laden 2D fighting game that contains a well-balanced roster of characters that were pulled from their own stable of IPs. 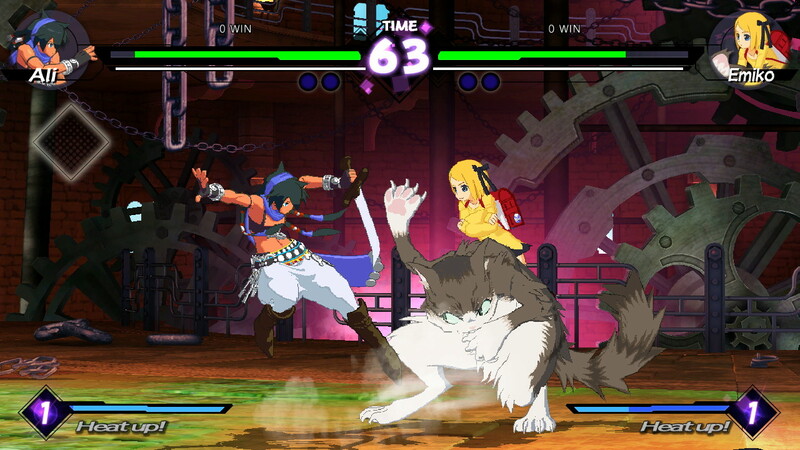 Fans familiar with developer Nicalis and their games will be elated to know that Blade Strangers combines the protagonists and their companions from various games such as Cave Story, Code of Princess and the Binding of Issac, and pits them against each other in a standard, versus fighter format. 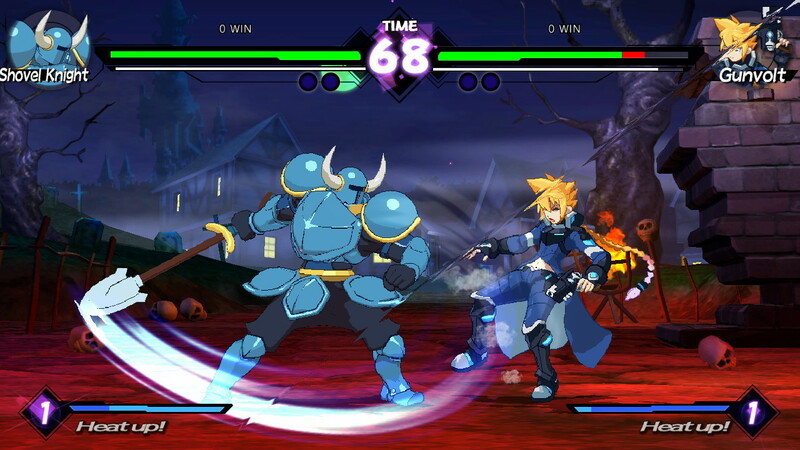 In addition, the game also includea guest appearances from both Shovel Knight and Gunvolt. The game’s roster contains a whopping 14 fighters. Like most fighting games, Blade Strangers contains a plethora of features. For starters, the game contains the obligatory ‘Story’ mode for gamers to complete. Story mode opens with a quote from Dr Johnny Wrench, which says, “We are nothing but one of a countless number of simulations performed by a countless number of computers.” This thought-provoking quote sets the premise for Blade Strangers. As Story mode unfolds, the player is introduced to the Motes – a group of sentient, computer-driven servers who are responsible for creating the known universe and all the realities that exist inside of it. During a recent catastrophe, a known reality called ‘Blade Strangers’ is mistakenly erased. The participants uploaded to this ‘reality’ perished during this crash, and the backup for the this realm – including the fighters chosen for the event – were lost. In a desperate effort to rebuild the tournament, the Motes decide to select fighters from different realms (i.e. simulations) who have never participated before. A recruiting process is normally used for the event, but the situation is dire. The Motes immediately transport the new fighters from their realms to the new Blade Strangers reality via a ‘transmitter’ device. From there, the game starts. Despite containing 14 characters, Blade Strangers only allows fighters from Code of Princess and Cave Story to participate in Story Mode. Guess fighters like Shovel Knight and Gunvolt cannot be used. There really is no reason for the aforementioned characters to be excluded from this mode, especially when the game’s story is taken into consideration. But with that said, Blade Stranger’s Story mode is entertaining and free of pointless filler. After each intermission, the player is presented with a fight connected to the story. The point – like in most fighting games with this feature – is to defeat each enemy to see the next part of the story. It also helps to expand upon the character being played. In retrospect, Blade Stranger’s story is probably one of the better ones seen in a fighting game. It stays on topic and it doesn’t over promise on its delivery. By the time it’s over, the player doesn’t feel slighted by a big build up in the story, only to be given a anti-climatic ending. Blade Strangers delivers and doesn’t disappoint where its story is concerned. 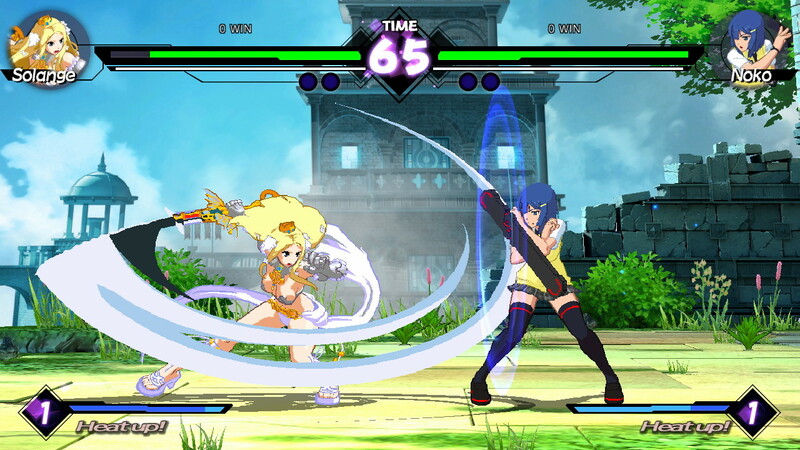 Blade Strangers also includes an ‘Arcade Mode’ for some old-school, arcade-like match ups against the CPU. While some fighting games seem to ignore this feature entirely, developer Nicalis realized the importance of including it. Gamers in their late thirties, early forties appreciate having this feature. While some may argue that a fighting game’s ‘Training Mode’ is sufficient enough to ‘warm up’, it really can’t compare to the nostalgia and the match consistency of Arcade mode. When a Training Mode match ends, it breaks the player’s momentum because they’re used to playing match after match in Arcade Mode. For some, this is the best way to warm up before participating in online matches. This isn’t being said to convince those who prefer Training mode to change their opinion; it’s just a friendly observation as to why some gamers prefer this mode over the other. But despite all this, developer Nicalis has implemented a comprehensive Training mode for all its characters. 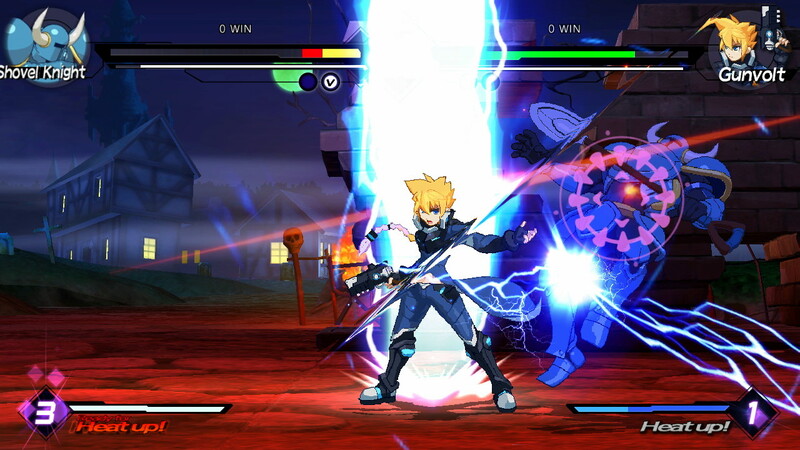 The game also uses a 4-button combat system that includes a Weak attack (Y button), a Strong attack (X button), Unique Ability (B button) and a Skill/Special Attack (A button). The type of attacks these buttons produce vary per character. For example: since Princess Solange is armed with the Sacred Blade DeLuxcalibur, she has a longer reach than most characters. When played correctly, the Princess can easily interrupt fighters who rely heavily on projectiles (i.e. Curly from Cave Story). This can be achieved by jumping forward into the air; pressing down on the left Analog Stock; and then pressing A button to Dive bomb the enemy. This technique can lead into a combo and also a ‘finisher’, if the on-screen Power Gauge is at maximum. Master T is another good example of how unique this game’s roster is. Instead of relying on weapons, Master T uses a barrage of punches and aerial kicks to deal damage. His playstyle is very reminiscent of Gato from Mark of the Wolves by SNK. While slower than the other fighters, Master T makes up for it with sheer brute force. He’s also a difficult character to learn. Master T’s kicks require good timing to be effective in battle. Blade Stranger’s netcode functions better than most 2.5D fighters. During the course of this review, a number of matches were played online, and only a couple suffered from input lag. The majority of the matches played felt smooth, and the controls functioned without issue. The only issue that was encountered were gamers that raged quit when they were losing a match. Luckily, the game penalizes rage quitters by placing a ‘quit’ percentage meter on their profile. This helps the player determine whether their next opponent will play fairly or not. Where additional features are concerned, Blade Strangers contains many. Aside from the modes already mentioned, the game also includes Missions (Survival Mode) and Versus (local play versus the CPU or friends). Moreover, there is a manual that breaks down character skills and the fighting system. As a game, Blade Strangers is a gorgeous-looking, solid playing 2.5D fighter with great online multiplayer. It also feels right at home on the Nintendo Switch. Plus, the game’s performance remains stable whether the Switch is docked or in portable mode. 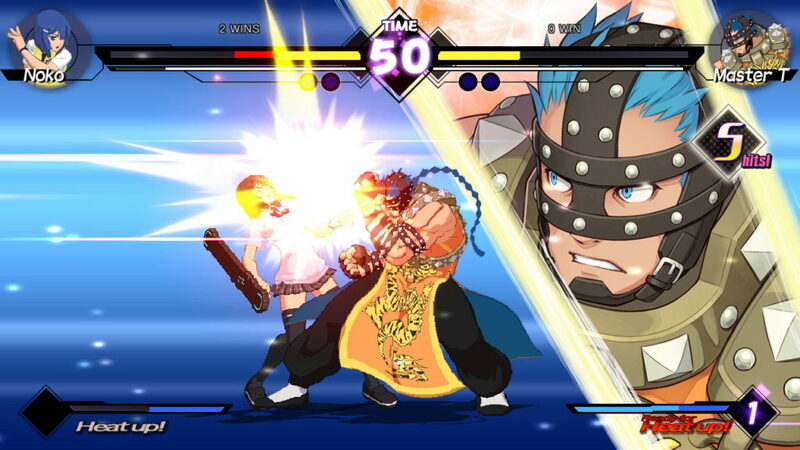 Basically, Blade Strangers is a must-have for fans of the fighting game genre. It’s one of the best 2.5D fighting games currently available on the Nintendo Switch. Eye-popping 2D graphics and smooth animation. Blade Strangers is one of the best fighting games currently available on the Nintendo Switch.